We are an Australian Government initiative to improve Australia’s effectiveness in civil-military-police collaboration for conflict and disaster management overseas. The ACMC engages with, and supports, government departments and agencies, non-government organisations and international partners, including the United Nations, on civil-military-police issues to achieve focused outcomes for the region and globally. We support best practice approaches to civil-military-police engagement by those involved in the strategic planning and delivery of conflict and disaster management activities. The ACMC is staffed by officials of relevant Australian Government departments and agencies. It is administered through the Joint Capabilities Group. Portfolio responsibility resides with the Minister for Defence. Heads of our primary stakeholder agencies signed a charter in 2014 which establishes our priorities and determines our work streams. 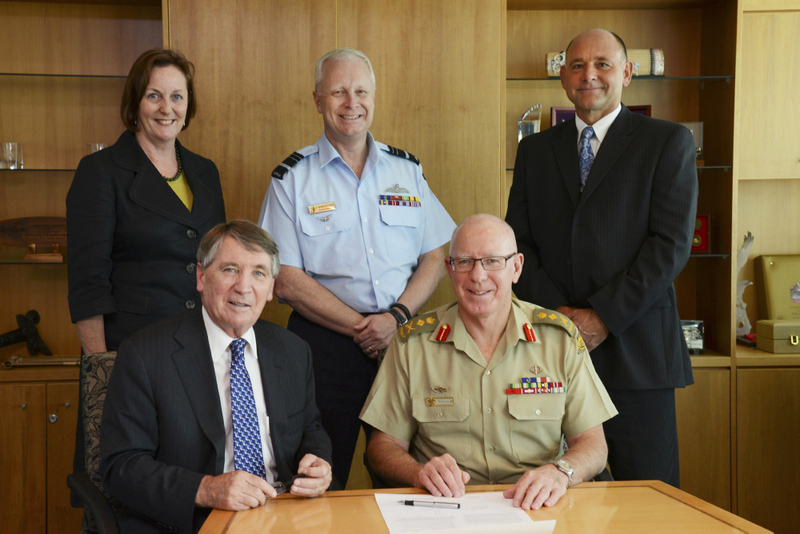 Vice Chief of the Defence Force Air Marshal Mark Binskin met with the Secretary and the Chief of the Defence Force as they signed the Australian Civil-Military Centre’s (ACMC) Charter in Canberra on Tuesday 1 April . Also in attendance were the Deputy Executive Director Mr Greg Elliott, as well as the Department of Foreign Affairs and Trade International Adviser and former Ambassador in Belgrade, Ms Helena Studdert. Executive Director Alan Ryan and Deputy Executive Director Glenn Dunbier speak to "ACMC on a Page" - a communication tool demonstrating who we are and what we do.